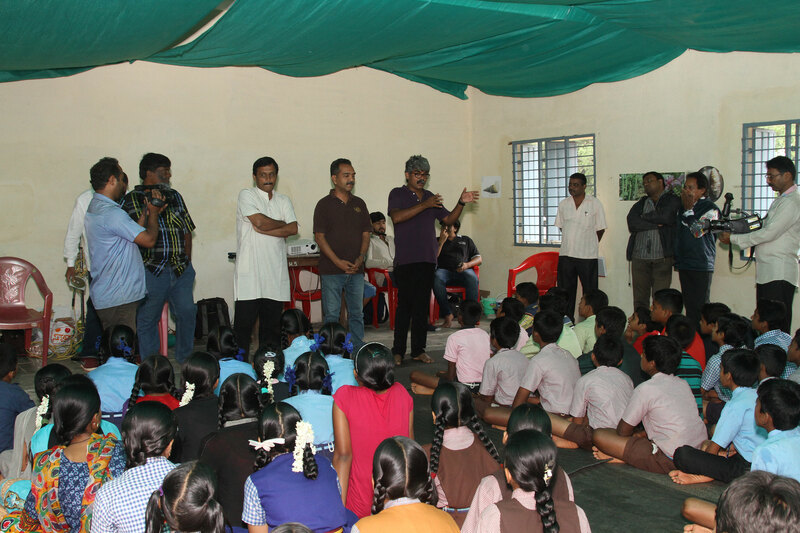 In June 2016 the SARA Centre organised and Environment Awareness Workshop for School Students of The Shimoga Region. 80 students from 10 schools participated in this three day event held on the 10, 11 and 12th June 2016. Inspiring children to imagine and prepare for an ideal sustainable living atmosphere. Educating children on the need for maintaining a healthy ecological balance, eco-conscious lifestyle and a healthy co-existence with flora and fauna. Inspiring them to work towards the regeneration of the lost biodiversity of the ecosystem. Likeminded resourceful persons from the fields of environmental sciences, governance and the arts collaborated in creating an engaging learning experience for the participant groups of school children. Prominent local writers, senior members of the society, people from state governing agencies like Gram Panchayats, and Forest Departments were invited to interact with the participants, share information and to converse with student groups via q&a sessions. The idea was to gather a sizeable number of children from various schools in Shimoga district for the three day proceedings. 5-6 girls and boys from 10 schools were invited to participate and thereby take the awareness campaign forward further into the region as ‘green ambassadors’. The proceedings of the workshop were documented and produced a docu-film for screening thereafter in all regional schools. The main organiser of the workshop was Delhi based artist and SARA Centre Director Arunkumar H G.
Environmentalists Subbanna Aneguli and Akhilesh Chippali gave talks and slide presentations about local flora and fauna, and also discussed pressing environmental issues with the participant groups. Theatre Activists from the K V Subbanna Ranga Samooha Theatre Group and Nada Chavadi Theatre Group Yesu Prakash Heggodu, Prasanna Hunasekoppa, Shreepad Bhagavath Chikka Honnesara and Gurumoorthy Varadamoola played a pivotal in conducting the sessions by creating engaging and interactive events tailored for the school children via song, dance and theatre. Artists Bakulesh Joshi and Avinash Gondalia engaged the children in participatory painting and wall mural workshops. Artist and curator Himanshu Desai oversaw the documentation of proceedings and also provided additional advisory support to the SARA Centre Management. Photographer Shilpa Joshi conducted the photographic documentation of the entire workshop. After the conclusion of the workshop, volunteers took the initiative to implement the action plans that emerged out of the workshop such as – awareness marches, plastic and pollutant collection polythene actions, afforestation campaigns etc. Around 2000 diverse species of plants were planted and distributed throughout the month of July 2016. The docu-film of the workshop was screened in about 15 different schools and other venues reaching up to 2000 individuals including parent communities etc.